design your own UNIQUE CALENDAR! Custom Magna-Cal with House Shape Magnet serves as a greeting card people will keep all year long. You design each month page, custom backer card & cover. 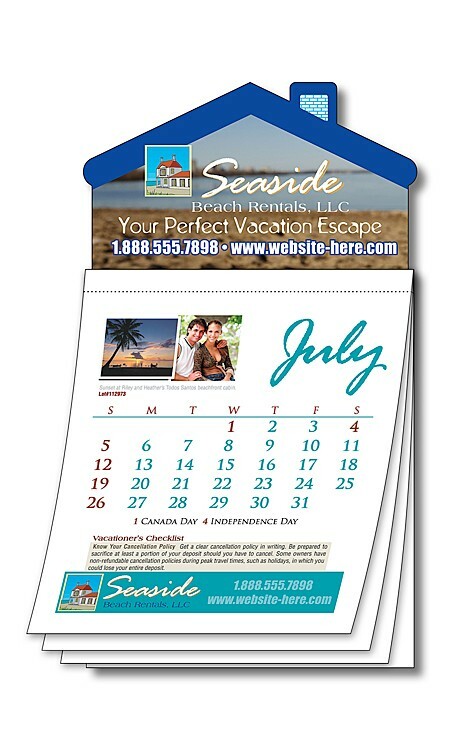 Complete with your House Shape Magnet at the top for an even more personalized calendar. 5,000 piece minimum, must be ordered in increments of 100 only. - No image bleeds on the custom month pages, custom backer card or custom back backer card. Final placement of the magnet header is not exact and may shift up to 0.0625” in either direction.